Vamp, aka HS Vamp, is a 2 1/2 year old black female born April 15, 2014. Her sire is Yahoo Omar and her dam is HS Babe. 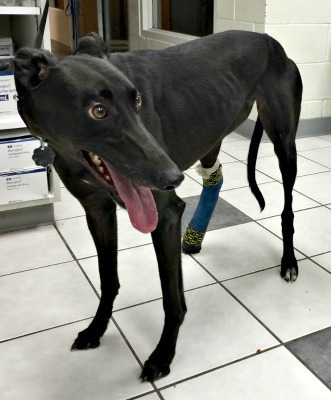 Vamp had 50 races to her credit all at the Florida racetracks of Melbourne, Pam Beach and Sanford-Orlando before her career ended with a central tarsal bone injury on September 2, 2016. Her surgery is scheduled with Dr. Robert Barstad of Dallas Veterinary Surgical Center on Tuesday, September 20. Vamp is not considered cat tolerant at this time. Vamp's surgery on September 20th placed an external fixator on her right rear leg. She is being kept quiet in her foster home until her estimated 9-10 weeks of recovery and healing are completed. Vamp has had her fixator removed, and has completed her medical procedures. She's ready just in time for Christmas! The special medical treatment cost needed by Vamp is why the Miss Mesa Fund was established. If you would like to help with Vamp's care, please take a moment to make a donation to the fund. You WILL and CAN make a difference in Vamp's life and the lives of other greyhounds in need of special medical care. Your help and support will make a difference - one greyhound at a time. Please note Miss Mesa Fund/Vamp on your check.